beautiful residential cul de sac, over the road from coralia beach and Coral Beach hotel so perfect location. 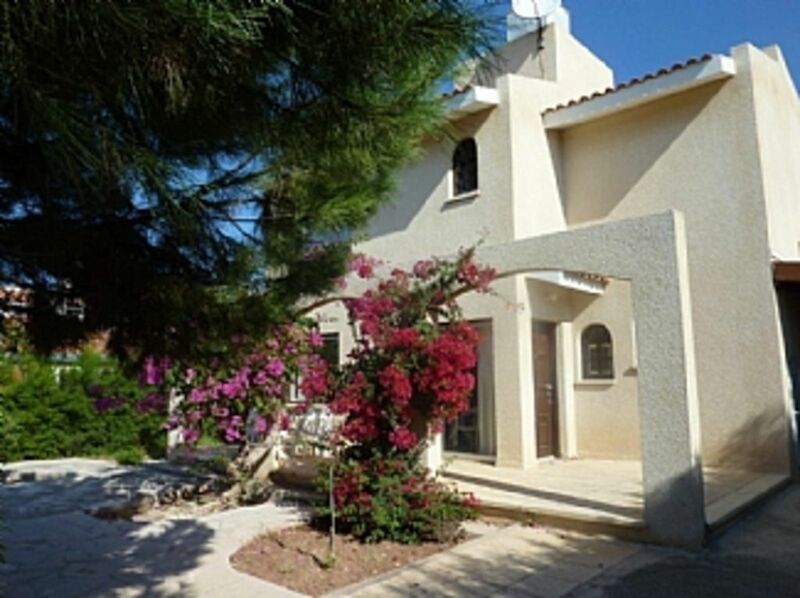 fully enclosed private 2 bed villa with pool, Spacious and open plan downstairs, a very popular villa with guests come back year after year. Brand newly installed for 2019 season .First floor bathroom with large walk in shower, WC and washbasin. Cloakroom downstairs with WC and wash basin. A wonderfully airy open plan room with patio doors to front dining terrace, large settees, coffee table, satellite tv & dvd, & stereo. Dining area with patio doors to dining terrace has large wooden dining table and 6 chairs, large sideboard. open plan dining room with large table and 6 chairs and large sideboard,. Patio doors leading to the rear dining area. lovely matues gardens with shrubs, olive trees, bougainvillea to all side, High hedging surrounds the rear garden with the pool. large pool side terrace, outside dining under wooden pergola.Front patio area with more outside dining. Paphos is the golf resort of the island, with three courses and more under construction. The wonderful Aphrodite Hills is East of Paphos, it’s a champion standard course being par 70/71 and 6232m, complete with excellent on site facilities and spa for those who don’t play golf! Secret Valley currently and 18 hole course again East of Paphos, panoramic views and is par 72 and 6120m, it is currently being extended to a 36 hole course! Tsada, this is 20 mins away an elevated position 550 metres above sea level ensures cool breezes in the summer, its again par 72 and 6060m, it has been redesigned and constructed in summer 2007. A fabulous new golf club opened in 2012 Elea golf club beautiful greens, stunning views, lovely club house. There is a driving range 10 minute drive away which also has pitch and putt, great fun! Nearest airport is Paphos which is a 30 minute drive. Larnaca is 1 hour 30 mins. The bus stop is 5 minutes down the road and runs every 10 minutes in the summer, 20 minutes in winter late into the night into Paphos and onto the Water Park A taxi from the airport is approx 45 Euros which can be arranged as can a very reliable car hire company. All the below distances are genuine, we have walked them dragging our two kids along! Supermarket, several restaurants and bars 2 minute walk. Coral Beach Hotel 2 minute walk. Coralia beach, 10 minute max walk to Coral Beach. 15 min stroll into Coral bay town centre. Paphos Zoo 10 minute drive. Paphos town, Harbour am Water Park 20 minute drive, Polis and Latchi 30 minute drive. Coral Bay has everything for the perfect holiday with the two beaches , water sports, scuba diving and abundance of restaurants and bars, bank, chemist, doctor, mini golf, go carting, numerous hotels. It really is the perfect all round location, however should you wish to explore Paphos there is a regular reliable! Cheap bus service into town only €1.50 to Paphos harbour!